Myanmar / Burma with Kids: Lake Inle (part 1). Houses on Stilts and floating islands. When I was just a small kid, one of my favorite books was a Dr Seuss book called “Come over to my House”. This was all about an American kid who travels all over the world visiting children in other lands, all of whom live in some kind of unusual house. 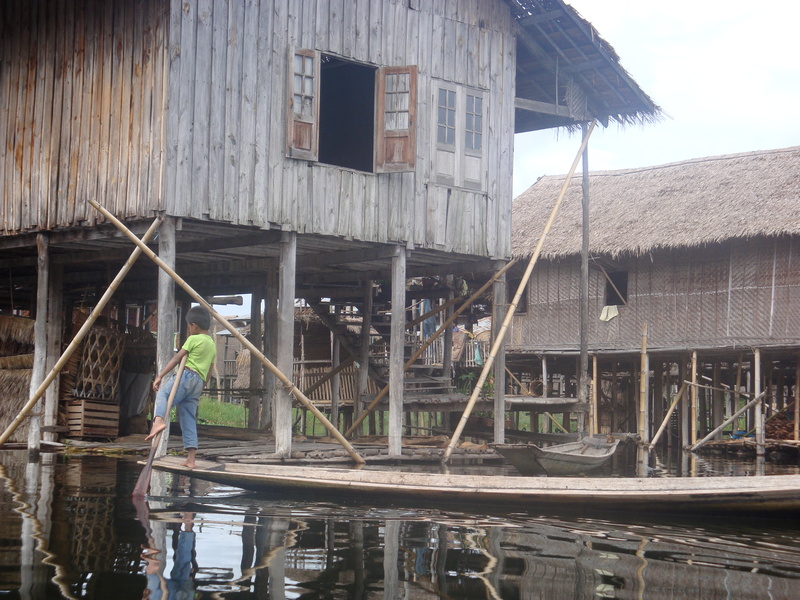 One of the kids lived in a house on stilts over water. When we reached Inle, I knew that we this was where Dr Seuss must have been talking about. Inle is one of Myanmar’s main tourist destinations. Situated in southern Shan State, it’s a huge, shallow lake inhabited by many people, Bamar and tribal alike and most people live in stilt houses, raised above the waters of the lake. Less than twenty years ago large parts of this region were completely closed to foreigners due to ongoing conflict between the Myanmar government and tribal people. For years now, the region has been peaceful and it is one of the highlights of any visit to Myanmar. Is it touristy – well, some of it is, but with Myanmar only receiving something like 2% of the yearly number of foreign tourists that Thailand does, touristy in Myanmar has a very different meaning from most anywhere else. We saw maybe 30 other tourists when we were at Inle. Driving from Pindaya we arrived at Nyaung Shwe, the main town near the lake. Our trip had been quite eventful as we’d had a flat tire on the way, but our resolute driver and guide repaired it quickly. While we were waiting for the tire to be fixed, a bus drove past us, and all of a sudden we had food raining down upon us – apples, candy and more. The people on the bus wanted to make sure that we weren’t going to be hungry while we waited for the repairs. This was just a tiny slice of time in our Myanmar travels, but it reaffirmed what we had come to learn about Myanmar people – that they are amongst the kindest and most caring that you will find anywhere. With our tire fixed we continued on our way and on arrival at the Nyaung Shwe jetty we were met by our longtail boat that would take us to our hotel out on the lake. 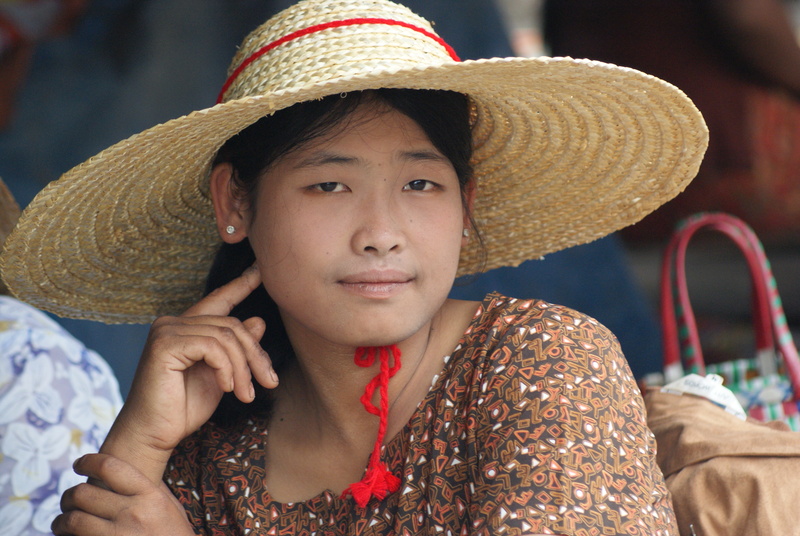 There are two main options to see and experience the Inle region. One is to stay in the town and do day trips from there, while the second is to stay at one of the hotels scattered on and around the lake itself. We would be trying both, starting with a stay of a few days at a hotel built right on the lake. 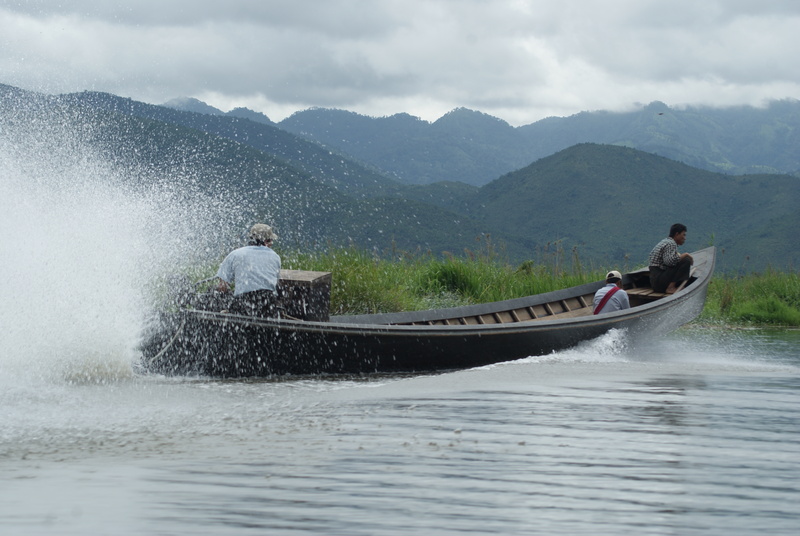 The typical transport on Inle lake is the longtail boat. These teak boats are manufactured by hand locally and are powered either by a longtail outboard engine (as found all over Thailand) or by a rower or rowers with long paddles. The Inle rowers have a unique style of paddling – they wrap their leg around the paddle and push it into the silt, and propel their boat along in this way. We however, had a 45 minute journey ahead of us to our hotel, the clouds were turning black overhead and I was happy to see we had a motor. Our boat was long and narrow, and we all sat one behind the other, on comfortable chairs that had been placed in the boat. We had life jackets and an umbrella each. Our luggage was going in a separate boat, well covered by a tarp. About 10 minutes out of Nyaung Shwe, the heavens opened up and within minutes we were wet through. Not only that, but we hit a traffic jam near the entrance to the lake – at least 20 boats were trying to get through a narrow channel that had become clogged with floating vegetation. Our driver waited a while and then took off in a different direction , which turned out to be a long way around, but which probably saved us some time anyway. We arrived at our hotel soaked, and were whisked off to our rooms immediately to allow us to get changed. Our hotel was great. There wasn’t that much to do, but the rooms all faced onto the lake and one could watch the lake traffic whizzing to and fro. There was also a large tower, which we climbed for a spectacular view over the whole area. One potential disadvantage about staying at a lake hotel is that you have to eat there – there isn’t anywhere else nearby. This turned out to be a plus – the prices were very reasonable (cheaper in fact than in Nyaung Shwe town we later learned) and the service was excellent. Inle is a big tourist draw, and we were not alone this time – the hotel was full of Spanish tourists, who apparently love to travel in the monsoon. Nights on the lake are quiet but early morning is not. The boat traffic starts up at dawn, and those longtails can be heard through the deepest sleep! The next day we toured the lake. There is a standard circuit that most people take but you really do have the freedom to choose what you want to see and where you want to go. Every day is market day somewhere along the lake, and we had a choice of two. We chose the one likely to have less tourists and in fact we were the only foreigners there. 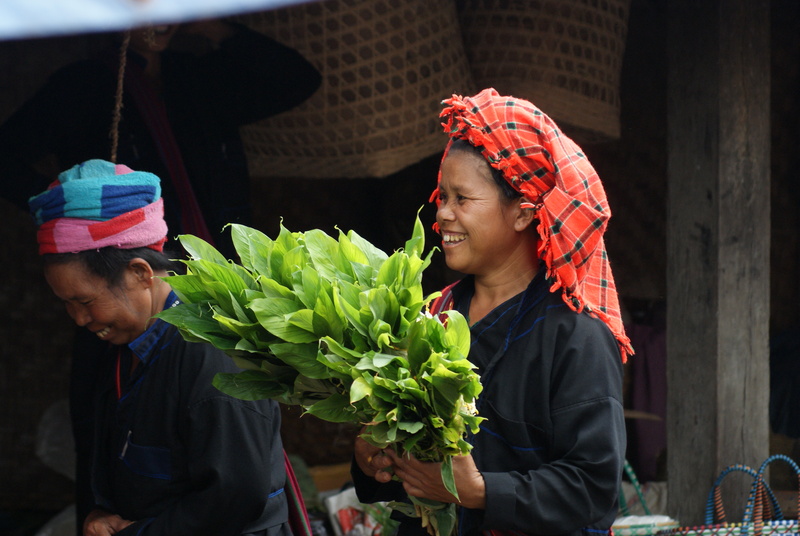 By now we had seen many Myanmar markets – the unique aspect of this one were the many local tribespeople that had come down from the hills, all distinguishable by a different headdress, and it was fascinating. We bought a local Shan bag in bright red/purple, worn in many different ways (often with the strap around the head for a heavy load). Men and women wear these bags differently according to local custom. 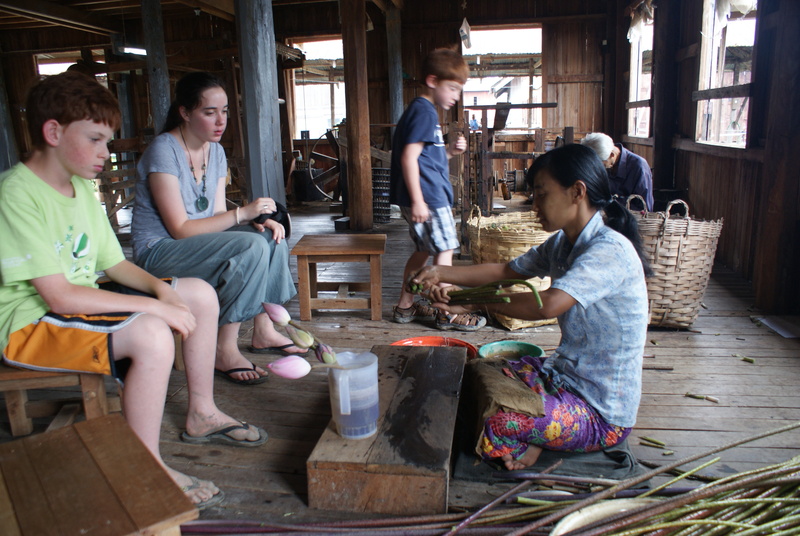 We visited some handicraft workshops – touristy yes, but the quality of the goods was excellent though expensive. 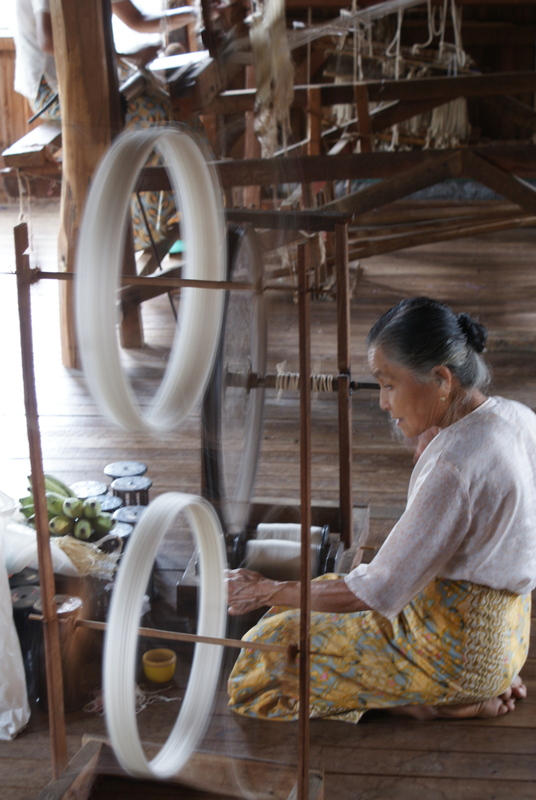 A local craft involves weaving “silk” from lotus flowers, a very time-consuming and expensive process. This was really interesting and the kids loved watching the people at work. We visited a local boat builder, a metal forge and more. We also had the opportunity to visit the famous long – necked or “giraffe ” women of the Padaung tribe, who are found elsewhere in South East Asia as well in Myanmar. Some years ago the Myanmar government removed (forcibly according to some but who really knows) some Padaung women to Inle so that tourists could see them. Many tourists choose to boycott this, but we didn’t know what to do. The reason was that when planning our trip, we had applied for permission from the Myanmar government to visit Kayah State, where the Myanmar Paduang live, but unfortunately, permission had been denied to us. (This is not untypical – as we saw in Kengtung, it is not easy to veer off the established tourist path in Myanmar). We decided to visit these women at Inle, but our guide first explained to them that we were genuinely interested in learning about them and their culture and that we had really wanted to do this in Kayah State. It was obvious that these Padaung women were pleased to see us – they understood that we really hadn’t come here to look a them as if they were some kind of zoo exhibit. We enjoyed our brief meeting with them and bought one of their woven bags. We also visited a couple of monasteries including the famous “Jumping Cat “monastery. Years ago, a local monk taught some cats to jump through rings at his command and suddenly his monastery was an established stop on the tourist circuit. He has since passed away but the tradition continues. It is impressive for about 10 seconds, and we felt really wasn’t worth the time. Offer any cat something to eat and they might well jump through a hoop for you! 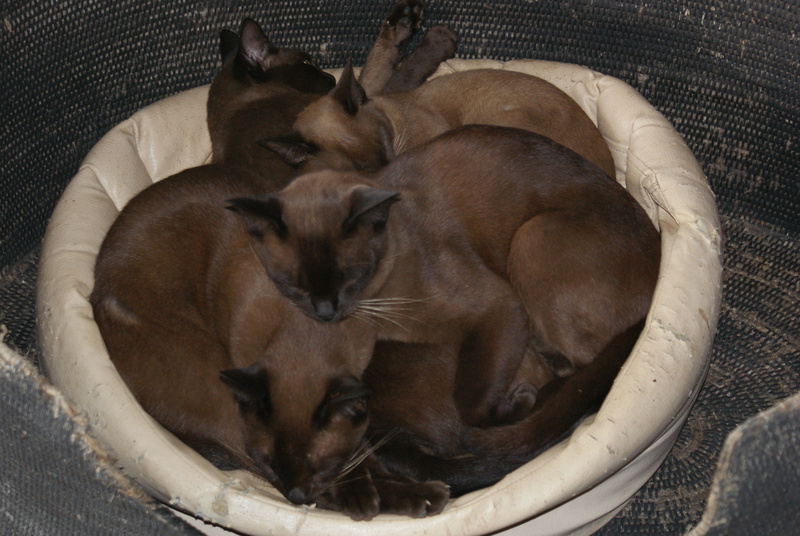 We also stopped at a house where Burmese cats are raised – a beautiful species of cat that is famous throughout the world, and the kids took a walk on a floating island. Crops are raised (mainly tomatoes) on these “islands” of weeds that surround every stilt village. Finally, after a long day, it was back to our lake hotel.